Living in the borough where the Queen Victoria was born, it just seemed very fitting for me to find out more about her history and watch the film. 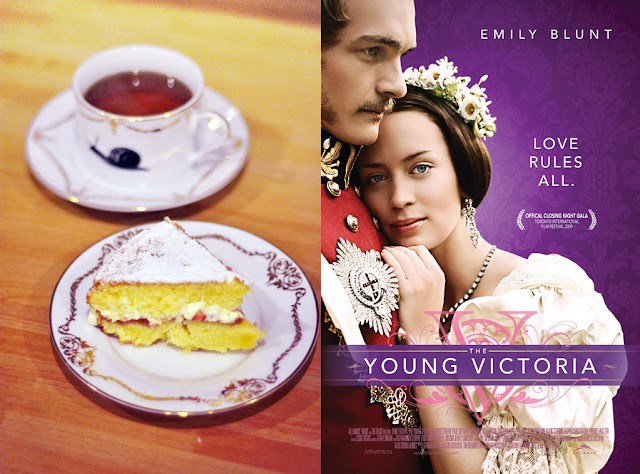 Enjoyed this film on a lovely Sunday afternoon with a Victoria Spongecake and good old English tea. Devine! As for the film, I was highly impressed, despite the fact that it was a historical film. Something worth mentioning is that historical films aren't my usual cup of tea (keeping this post as 'English' as possible haha) hence me being highly impressed. It's not just the story of the Queen, but also how she have found the love of her life. It is a rather unusual love story, note that Queens back then used to propose to a man, and not vice versa, and note that the family had an influence on who a Queen would pick as her spouse. That on its own is unusual, but also the fact that Victoria has picked her future husband (her cousin), despite the fact that her family arranging a marriage to her other cousin. Another unusual thing was the amount of love she had for Prince Albert was admiring. Most monuments (especially the Prince Albert monument and the Royal Albert Hall in South Kensington) were dedicated to him from her after his death. Anyhow, I feel like I'm spoiling all films for you guys with these post…its worth watching it, you'll like it or maybe even love it! For the spongecake recipe, check out here. Sorry I'm not lazy (maybe a little…) but ultra busy, so I'll have to rush this blog post and keep it short.